DEERFIELD, Ill.An experimental Alzheimer's drug that showed promise a year ago failed to slow mental decline or preserve physical function in a major trial of 390 patients with mild to moderate disease, Baxter International Inc. announced Tuesday. Baxter says that people who received 18 months of infusions with its drug, Gammagard, fared no better than others given infusions of a dummy solution. 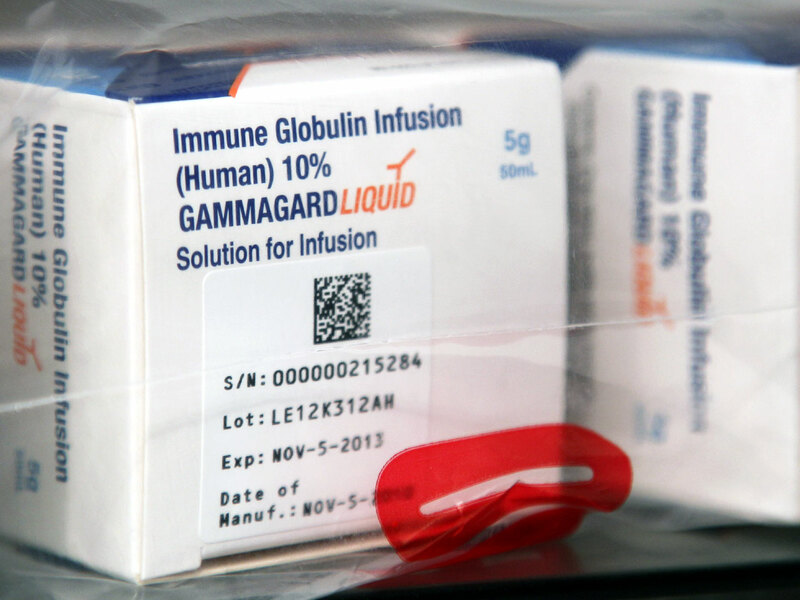 Gammagard is immune globulin, natural antibodies culled from donated blood. Researchers thought these antibodies might help remove amyloid, the sticky plaque that clogs patients' brains, sapping memory and ability to think. Patients with moderate disease and those with a gene that raises risk of Alzheimer's who were taking the higher of two doses in the study seemed to benefit, although the study was not big enough to say for sure. "The study missed its primary endpoints, however we remain interested by the prespecified sub-group analyses" in groups that seemed to benefit, Ludwig Hantson, president of Baxter's BioScience business, said in a statement. Gammagard is already sold to treat some blood disorders, and the results of the Alzheimer's study do not affect those uses. About 35 million people worldwide have dementia, and Alzheimer's is the most common type. In the U.S., about 5 million have Alzheimer's. Current medicines such as Aricept and Namenda just temporarily ease symptoms. There is no known cure. Excitement about Gammagard grew last summer, when researchers reported at an Alzheimer's conference that the drug had stabilized Alzheimer's disease for as much as three years in four patients who had been receiving the highest dose of it for three years in the study. People typically go from diagnosis to death in about eight years, so to be stable for so long was considered remarkable. "This is the first study to report long term stabilization of Alzheimer's symptoms with IVIG," study author Dr. Norman Relkin, an associate professor of clinical neurology and neuorscience at Weill Cornell Medical College in New York City, said in astatement at the time. "While the small number of participants may limit the reliability of our findings, we are very enthusiastic about the results." The new results on the full group of study participants are disappointing, said Relkin. "The bar was set very high" for the drug to show improvement, and "there does appear to be a signal" that it helped the two-thirds of patients in the study who had the apoE4 gene that raises the risk of developing Alzheimer's, as well as those with moderate versus mild disease, Relkin said. No new side effects were seen in the study. About 5 percent of patients on the drug had a rash and decreases in hemoglobin, which carries oxygen in the blood. There were 17 serious reactions, 12 in the drug group and five in the placebo group. Full results will be presented in July at an Alzheimer's conference in Boston. Meanwhile, other studies are under way to test drugs earlier in the course of the disease. An experimental drug, Eli Lilly & Co.'s solanezumab, showed some promise in that setting in an earlier study.